Happy New Year to you... he he....Happy New Year to you...ho ho...Happy New Year Dear All....Happy New Year to you.... Aah, these lines take me back to the old Hindi numbers with jazzy music, sensible lyrics, and dancing rhythm as we had in the famous Indian Hindi song.... 'Baar baar din ye aaye, baar baar dil ye gaye, tum jiyo hazaaron saal, ye meri hai aarzoon...Happy Birthday to you...he he....Happy birthday to you...ho ho.....'. Now here, it's just about the birthday of 2012, so my heart is pouring smiles and welcoming it with a warm feel. Serves: There's going to be a fight over each piece, so no serving suggestions!! Sift the maida/all purpose flour with the Cocoa Powder, Baking Powder and Baking Soda/Eno. 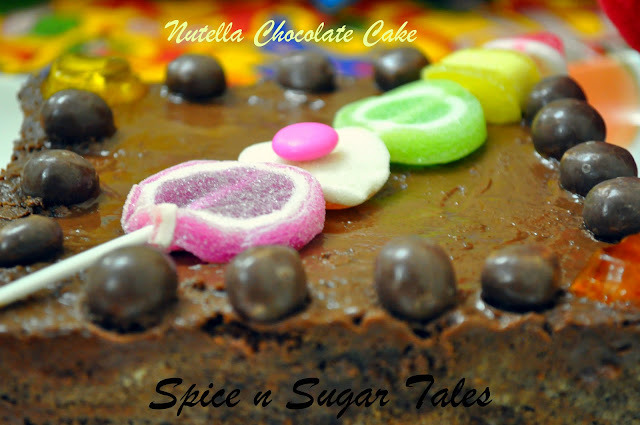 Take the butter, Nutella and beat sugar with it till it goes light and fluffy. Do not melt the butter, rather keep it at room temperature. Now transfer this mixture into the greased pan and bake it on 180 degrees for 25-30 minutes. On the other hand, melt dairy milk bar, butter and Nutella by double-boiling in which we boil water in a pan and keep the chocolates in a small bowl floating in the pan. 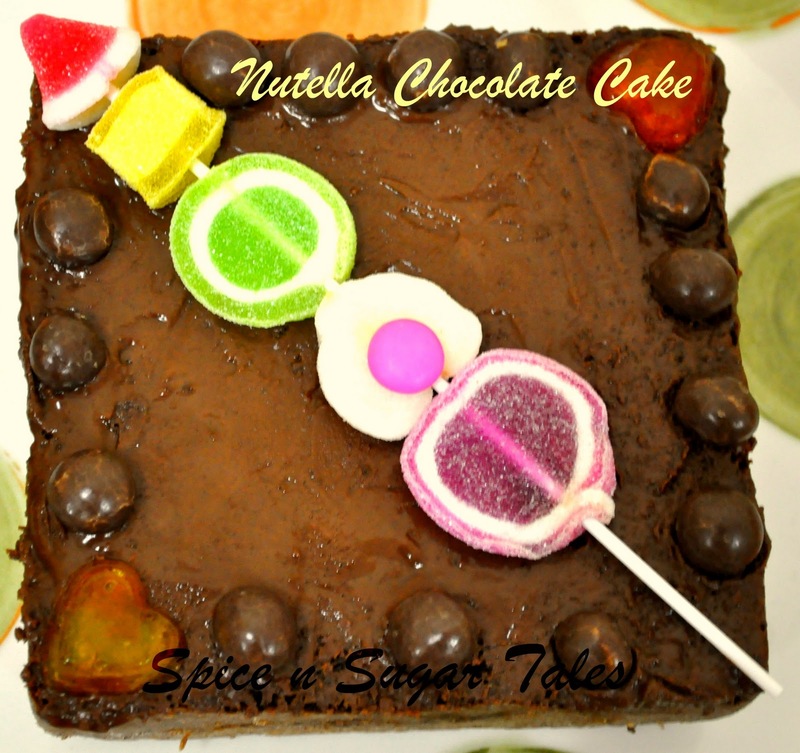 The chocolate might not melt in a completely creamy form, but when you touch it with a spatula, it will spread easily. This is the correct consistency. 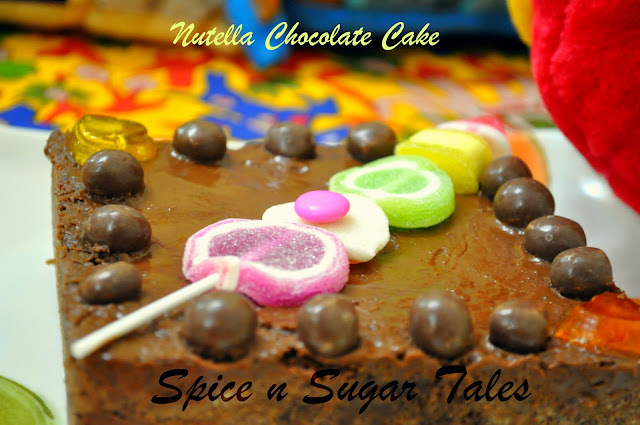 Layer the upper part of the cake generously with the molten Nutella Chocolate and embellish the remaining cake with your creativity, using choco balls, marshmallow and jelly. Do not invert the cake before it cools down else it would break. Nutella is nothing but a Chocolate Hazelnut Spread, so in case you don't have it, add any chocolate. That's a very yummmy mouthwatering bake Anjali. happy new year to you too. 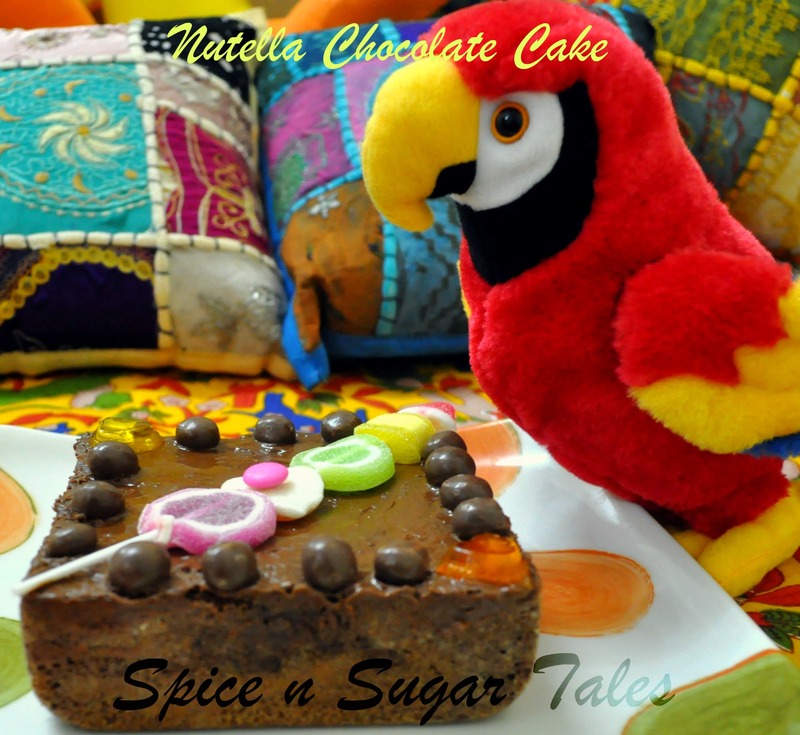 Delicious and beautifully decorated cake...nice recipe !!!! awesome cake full of chocolate..would you like to send it to my event. Please stop my blog and receive your award for participating in Roundup for Yummy Dessert 4 New Year event.